In an exciting development, Cheshire-based construction company, Graham Heath Construction (GHC) have announced that they will be working in partnership with specialist commercial energy consultants, The Mikhno Group, to manufacture steel framed eco-buildings for the agricultural sector. This initiative will be unveiled for the first time at the Grassland & Muck show (24th – 25th May 2017, Stoneleigh, Warwickshire). For over 20 years, GHC have been manufacturing high-quality steel-framed buildings for the agricultural sector. 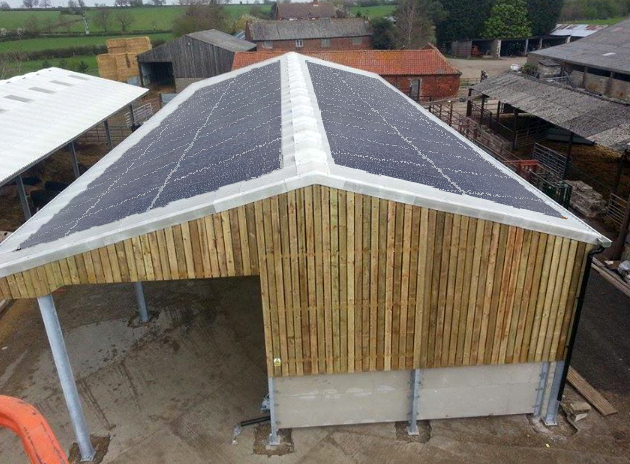 Having reviewed their own green credentials and energy expenditure, GHC recognised that there was an opportunity to help UK farmers tackle their spiralling energy costs by installing rooftop photovoltaic (PV) solar panels as part of the construction process of their steel-framed buildings. The electricity generated will be used onsite and can also provide an additional source of income. The benefits of solar PV technology are well-documented and for the farming community include reduced energy costs, enhanced value of buildings and land, improved energy rating of farm buildings and reduced carbon footprint. “We hope that this new initiative clearly demonstrates our commitment to developing a greener future for our business and our customer’s businesses,” continued Paul. “We estimate that our solar PV panels can reduce electricity bills by up to 60%* (*based on annual usage and consumption). These substantial cost-savings certainly provide UK farmers with an attractive business proposition,” said Paul Stoker, Managing Director, Mikhno Group. Throughout the show GHC will be exhibiting their full product range, including dairy and general purpose buildings and silage clamps. To celebrate the launch at the Grassland and Muck show, GHC will be offering fully-funded solar PV installations to every customer who places a building order before the end of May 2017. Image attached: Illustration demonstrating solar panels on an agricultural building.